The nursing cover came from a tutorial I found online. 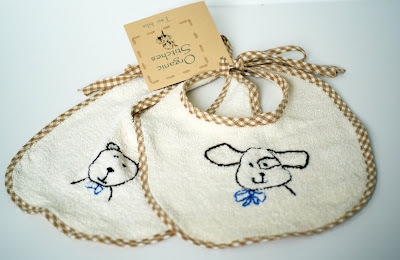 The bibs, washcloths and burp cloths were my own design. Let me tell you, that terry was NOT easy to work with! Since I was sewing the woven gingham onto the stretchy terry, disaster happened initially. Then I smartened up. 1. Cut out the piece of terry you need. 2. Run a gathering stitch around the perimeter of the shape. If it's a large shape, you might want to stop and start the gathers periodically to make them more manageable. 3. The gathering stitch process will stretch out the terry. Use the threads from the gathers to pull the terry back into shape. Sew on your binding! The aunt-in-law wanted me to set up a business to sell this line of products, so I settled for an etsy shop. 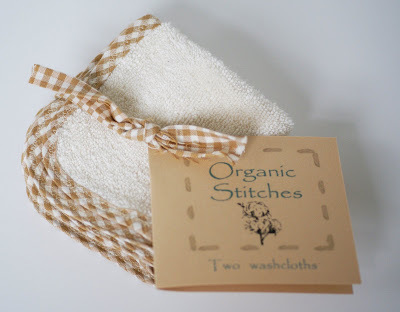 I now have an etsy shop: organicstitches.etsy.com. This will be an exclusively organic shop. If it goes okay, I might expand my line ;) . 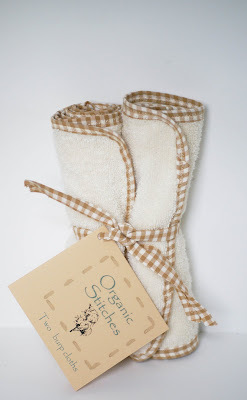 So, if you know someone in need of an organic baby item, send them my way! Lots of interesting things happened this week/weekend, including an addition to my sewing menagerie and a new non-living addition to my home. I'll be blogging about them soon! So cute! 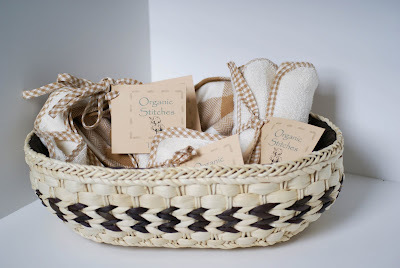 Are the fabrics organic?! Where did you find that?? Yup! 100% organic Michael Miller fabric. 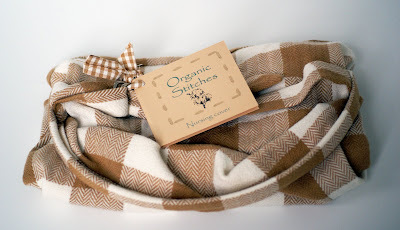 There's fleece, terrycloth, sheeting, felt, the brown gingham, and the brown herringbone check. It's pricey! I found it at a local store, but you can buy it online and on ebay! i love it! you are amazing and are officially dubbed as my vendor for my baby shower ;). i have a blog related question...how did you get the icon in the URL toolbar to have the picture of the Q? LOVE all your items! They look so clean and simple, and very useful. May I ask how you get your nice labels for your baskets? Are they made of paper, and if so, how did you make them? Thank you Shannon, Hillary, and Yayaorchid! Yayaorchid, I designed the tags myself. They are just printed out on brown scrapbook card stock! Those are beautiful...I am sure they will be treasured. I am trying to become a sewer, I find I am more of a 'seamripper' these days. I want to make some bibs, we are adopting from Ethiopia and I'd like to create some special things while I am waiting.